In 1963, Annie Ernaux, 23 and unattached, realizes she is pregnant. Shame arises in her like a plague: understanding that her pregnancy will mark her and her family as social failures, she knows she cannot keep that child. This is the story, written forty years later, of a trauma Ernaux never overcame. In a France where abortion was illegal, she attempted, in vain, to self-administer the abortion with a knitting needle. Fearful and desperate, she finally located an abortionist, and ends up in a hospital emergency ward where she nearly dies. In HAPPENING, Ernaux sifts through her memories and her journal entries dating from those days. Clearly, cleanly, she gleans the meanings of her experience. Born in 1940, Annie Ernaux grew up in Normandy, studied at Rouen University, and later taught at secondary school. From 1977 to 2000, she was a professor at the Centre National d'Enseignement par Correspondance. Her books, in particular A MAN'S PLACE and A WOMAN'S STORY, have become contemporary classics in France. THE YEARS won the Prix Renaudot in France in 2008 and the Premio Strega in Italy in 2016. 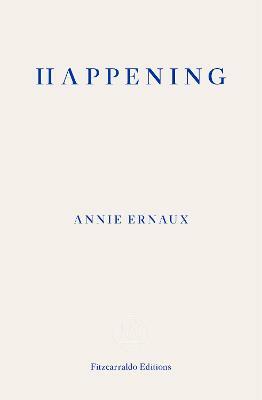 In 2017, Annie Ernaux was awarded the Marguerite Yourcenar Prize for her life's work.